The term firewood BTU is used to describe how much energy a fuel (firewood) has. Most people burn firewood for one reason....heat. So, it only makes sense to burn a firewood that generates high BTUs so your home can stay as warm as possible. BTUs are especially important during those cold winter nights when the outside temperatures can sink into negative digits and you need all the heat you can get out of your wood stove. BTU or British Thermal Unit is the amount of energy required to heat one pound of liquid water by one degree fahrenheit. To get the most energy out of your firewood the wood should be seasoned. Seasoned firewood is described as having a 20% moisture content. Seasoning firewood takes time. A good rule of thumb is to cut firewood this year so you can use it next year. Keep up the rotation and you will always have good, dry, seasoned wood to burn. The picture below shows a good example of dry, seasoned firewood. Notice how the wood looks gray in color with cracks forming on the ends of the split logs? This seasoned firewood is ready to burn and will provide you with a much more enjoyable wood burning experience and more firewood BTUs. Burning green wood decreases the BTUs generated by the fire. As the green wood burns, the energy created from the fire is used to evaporate the moisture resulting is wasted heat. If you've burned wood before there's a pretty good chance you've heard that sizzling sound coming from a log that's on the fire. In fact, if you look at the ends of the log after it has been on the fire for a few minutes you can even see the moisture bubbling out from the cut ends. This is a good example of wasted heat and unseasoned firewood. Green wood also tends to smoke and smolder creating the possibility for creosote to form in the chimney. The creosote will stick to the sides of the chimney and can ignite causing a chimney fire. 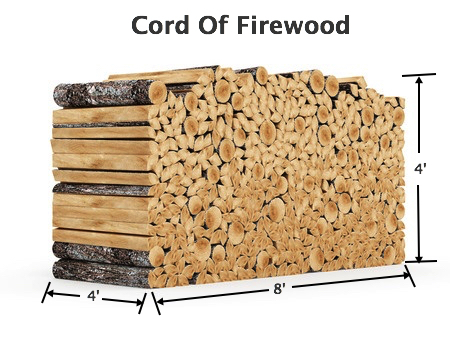 A cord of firewood measures 128 cubic feet. Typically the firewood is cut into 16 inch lengths and is tightly stacked in three rows, 4 feet high and 8 feet long, totaling 128 cubic feet. Depending on where you live the amount of firewood you have can be referred to by several different names. For example, a rick or face cord of firewood typically consists of a single row of firewood stacked 4 feet high by 8 feet long. It's essentially 1/3 of a full cord of firewood. The only issue with terms like rick and face cord is that the lengths of the firewood can vary, which ultimately changes the total cubic feet in the firewood stack. While this isn't a huge issue, it is something you want to consider when buying firewood by the face cord compared to buying it by the full cord since a true full cord should be consistently 128 cubic feet no matter which supplier you buy it from compared to a face cord which will vary. Okay, now that we've determined the difference between seasoned vs green or wet firewood and the difference between a full cord vs a face cord, let's look at the amount of BTUs generated from a specific firewood type. The following chart describes the BTUs generated from different species of popular firewood. As you can see there's a lot of different firewood species to choose from. Not all of the options listed above will be available to you since some trees only grow in certain parts of the country. However, this firewood BTU chart can be very helpful because it gives you an idea of how various firewood types compare to each other. Generally speaking, hardwoods are much more dense and will create more heat than a softwood. 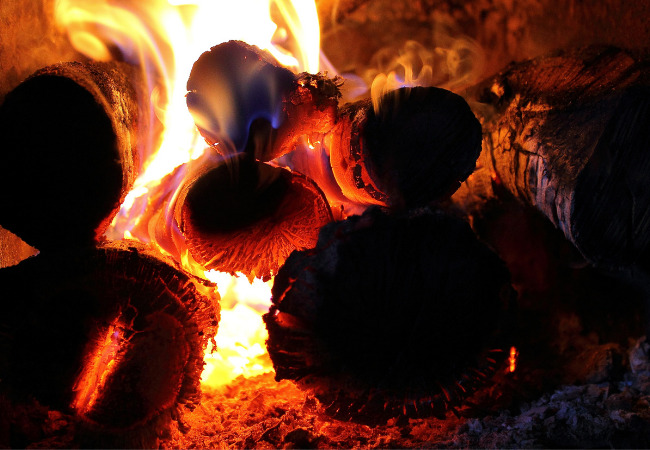 Hardwoods have great coaling qualities and work well for an overnight fire when you need enough coals left in the firebox to easily light a fire the next morning. Softwoods on the other hand tend to light a lot easier than a dense hardwood but don't burn as long. It can get a little confusing at times though because not all hardwood and softwoods are equal. Some hardwoods are actually "softer" than a high quality softwood, so saying that all hardwoods are superior to all softwoods simply isn't true. For example, balsa is considered a hardwood but it's actually really soft and it's the softest of all commercial hardwoods. Douglass Fir makes great firewood and in some regions it's the one of the best firewood choices available, but it's technically a softwood. In the end, when I cut my own firewood I normally don't get too caught up on the exact amount of BTUs a specific firewood type creates. As long as it's a good quality piece of wood, a few firewood BTUs here and there really won't make a huge difference. What makes the biggest difference is dry firewood compared to wet firewood. Do yourself a favor and have plenty of dry firewood on hand to last you the entire winter. However, if you're going to buy firewood from someone else why not get the best firewood available especially if it's all the same price? Here's a tip I've learned from making plenty of mistakes over the years. When you think you have enough wood cut to last throughout the heating season, cut an additional 25 percent of firewood and let it season throughout the summer. By having an additional 25 percent of dry firewood you won't have to worry about running out of wood due to an exceptionally cold winter. Plus, if you don't need to burn that extra 25 percent of wood, it will still be available for next year.